D3 Home Furniture contains over 200 parametric objects for living, dining, and sleeping. These parts add classic, everyday furniture for making your designed space feel "at home" (or at work). Included are over 30 seats, a variety of tables, complete dining settings, four types of bed frames in all sizes, clocks, flowers and plants, rugs and paintings, outdoor furniture, and electronic equipment to enliven any living space. Build your own china cabinet or armoire using modular storage components with base, drawers, doors, and cap. 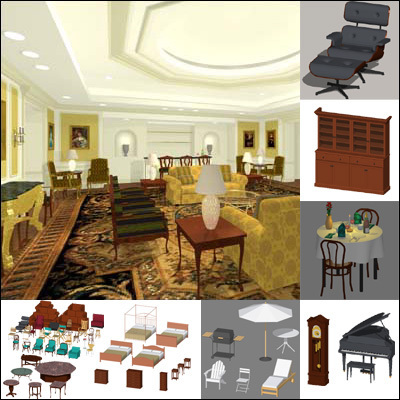 Each group of furniture type is pre-assembled into ArchiCAD Modules which can be merged into your plan to work as a template, greatly speeding up design and production. * NEW 9 classic chairs for a total of 32 chairs - couches, love seats, chairs, stools and rockers. * NEW 5 tables for a total of 14 tables. * NEW lamps - table, wall sconces and hanging. * Dining tables have adjustable tablecloth with complete dining place settings. * Four types of bed frames in standard sizes. * Clocks - grandfather, mantel, and wall - with definable time. * Upright piano and a baby grand piano that stretches to a concert grand. * Flowers in vases and plants in pots. * Oriental rugs with four designs. * Electronic equipment - TVs with user defined picture images, stereo components, and speakers. * Build your own china cabinet or armoire using modular storage components including base, drawers, doors, and cap. Copyright © 2013 Dimensions Design Group, Inc. All rights reserved.